Isn’t it fun when you watch a movie and God whispers some spiritual truth to the ears of your heart?! It is so cool to witness God’s truths and promises from scripture especially when it reveals itself in a movie, and it happens every time I watch the 2006 Warner Bros. Pictures movie: 300. Yes, 300. I absolutely love that movie. I can’t help but lose my breath as I watch it and see all of the instances it points to history books and scripture, all the while painting a beautiful picture of how both Christ and the evil one sees us! 300 is a controversial and totally inappropriate movie for anyone who’s, y’know pretty much not married, but I tell you I LOVE that movie!! First off it floors me every time, that this stand Leonidas and the 300 Spartans took against the mighty Persian army is true. You can read all about the Battle of Thermopylae in history books and archives. Unbelieveable! Granted, Xerxes is the Greek name for Ahasuerus, and he does not marry Esther until approximately the year following the battle, but still I find it fascinating and it puts the movie in a whole new light. 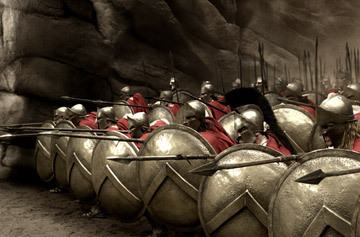 Third, there is a moment in the movie when the Spartans arrive at the “Hot Gates,” the exact location they plan to overthrow the Persian army. As they arrive and stand on a high cliff overlooking a sea filled with Persian ships, a powerful storm ensues and the raging sea tramples upon and swallows those mighty ships. The Spartans celebrate the “glorious rain” and rejoice in the power they are witnessing. “Yes! I want it all!” Ephialtes screams as he falls to his knees in devotion to the god-King Xerxes. How many times have we said those exact words and knelt to the wrong king? And finally, there is a moment in the movie where Leonidas meets Xerxes face to face. 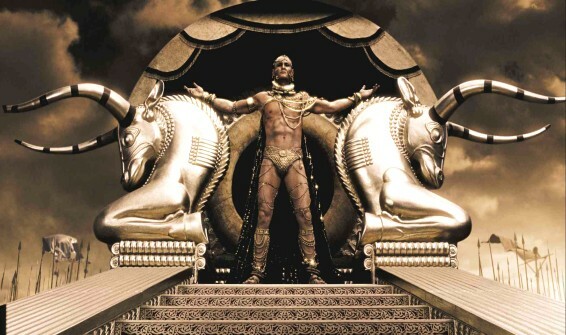 Xerxes cautions Leonidas of the power and destruction he can ensue, and advises Leonidas to surrender and bow to him.